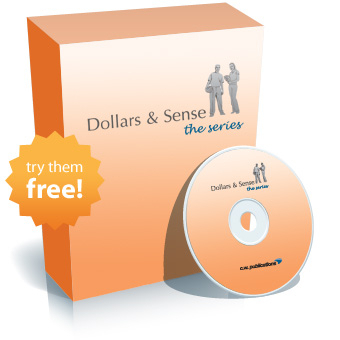 The updated Dollars & Sense Series has everything you need to help teach your students how to make positive financial decisions and live in the real world. Five comprehensive software titles that help teach your students the nuts and bolts of persona finance. 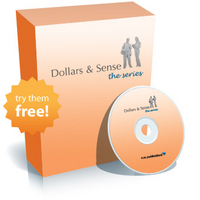 You get: Banking, Budgeting, Credit, Saving and Investing, and Taxes. You get all the Dollars & Sense activities, plus Check it Out — a simulation in which students will maintain a personal checking account involving all types of transactions. They'll make deposits, ATM withdrawals, write checks, use their debit cards, maintain their register and reconcile with their account statement. You get all the Dollars & Sense activities, plus Budgeting Game — a simulation in which students must create a spending plan that fits their income and family size. They'll make real spending decisions in 15 different categories from housing to food to entertainment. You get all the Dollars & Sense activities, plus Charge It — a simulation in which students will have to make smart credit choices. Will they be responsible or ruin their credit rating? You get all the Dollars & Sense activities, plus netTrade.com — a simulation in which students try to maximize their profits in the market by trading stocks and mutual funds each day over a simulated three-month period. They'll make their trading decisions based on the background and performance of the companies and by analyzing the daily news. You get all the Dollars & Sense activities, plus 1040 EZ — a simulation in which students will be completing the 1040EZ federal income tax form. Will they get a refund or owe Uncle Sam money?